Changement de thématique pour cette nouvelle carte! J'ai colorié l'image en début de semaine, en vue de réaliser une carte style "vintage", en cours de route, j'ai changé de papier, ce qui a aussi entraîné une rtation du sketch. J'ai repris cette image de Romantic Tilda, que j'adore. Je voulais aussi renouer avec mes Copic. Bien que j'aie définitivement plus d'aisance avec les Prismacolor, j'aime travailler avec ces marqueurs. J'éprouve de la difficulté à "Blender" comme je voudrais. Alors qu'avec les crayons, c'est si simple... Enfin, avec ces couleurs de violet, je suis contente du résultat. I traded the Christmas theme for a vintage look! I started coloring Romantic Tilda at the beginning of the week, unfortunately, I only had time this afternoon to complete the whole card. I couldn't make up my mind as to what kind of paper would bring the romance in Tilda. I chose to rotate the sketch to suit the mage size. I had also decided to renew with my Copics. I am more at ease with the Prismacolor, because it's easier to blend the colors like I want them to be! Anyway, I am happy with the results. I'll keep on practicing, I have a few stamped images waiting! Étampe/Stamp: Romantic Tilda, presently out of stock, but ask Diana herefor up-date on this stamp. bravo pour cette belle carte!! Beautiful job with your coloring. She looks so pretty and I like the way you did the sketch! Terrific job on you card Danielle! Danielle, beautiful job on your card! She's so sweet. Ah les ombrelles, comme c'est joli! Ta carte est tout simplement époustouflante, j'aime ce qui s'en dégage! Ton "blending" est très bien réussi ma chère! Félicitations! This is a really pretty card Danielle, the coloring is absolutely wonderful and I really love the unusual shape of the sentiment. Oh my Danielle, she is definitely adorable! I think she has to be one of my favorite images. If truth be told, aren't they ALL?????? Oh Danielle!!! It´s sooo beautiful! The image work so beautifully with the sketch and your copis colouring is fabulous!! I´m a little tired... just arrived from a trip, but had to come here and see your new card. I´s so adorable!!! Love it too much! Encore une fois bravo pour cette oeuvre. So pretty Danielle. The purple is beautiful paired with your subtle DP. Your coloring is awesome! 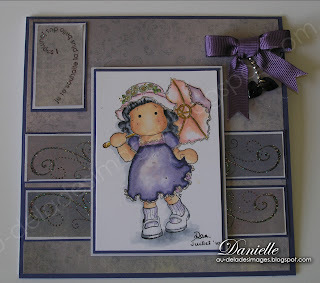 Danielle, love your card, purple is my fave color, and all that swirl sentiment and swirl DP. What a great card. What a sweet card Danielle, really wonderful and lovely!